The bench press is probably the most popular exercise in the gym. Everyone looks forward to chest day, and you really can’t effectively build big, thick, fully developed pecs without some form of bench press. It’s a big, showy lift, and the one that’s always called into question when first speaking to someone about pumping iron. So let’s get all of those big questions answered, go over some techniques and tips and maybe dispel a myth or two. [caption id="attachment_4869" align="alignright" width="351"] Pic: Muscle Gaining[/caption] How much weight should I be lifting? How many reps should I do? Am I benching correctly? Why isn’t my chest growing? Is the bench press all it’s cracked up to be? Why do my joints hurt? How many sets do I need to do to grow? Is the barbell bench press good enough on its own? How many times a week should I bench press? Should I start my chest training with bench press? Questions, questions questions! The bench press is such an important lift, it is the biggest lift you will perform for the upper body, and it stacks on the most mass. But it’s all too often performed incorrectly, giving it the unenviable label of the lift causing the most injuries. The most common mistake and leading cause of all injuries and technique problems are stacking too much weight on the bar. Everyone wants to have a big bench press, but unless you’re doing it correctly, and with a full range of motion, your figures count for diddly squat! 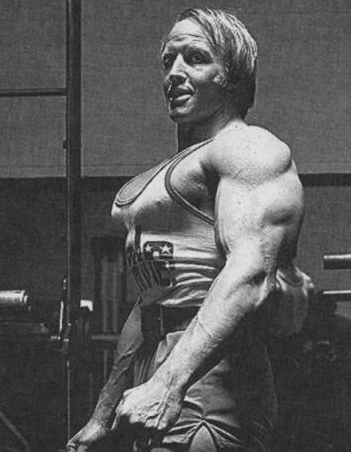 So, the first rule of bench pressing is….. take ego out of the equation!!! Use a weight you can lift correctly, with a full range of motion. Otherwise, your big, impressive bench numbers are nothing more than a recipe for an under-developed chest and a nasty injury or two. An excellent way to add extra muscle building power and reps to your bench press routine is adding creatine monohydrate to your supplement stack. Creatine works by ferrying energy to your hardworking muscles just as they approach exhaustion. Sheer Strength Labs Creatine Monohydrate is 100% pure and guaranteed to add pounds to your big lifts. 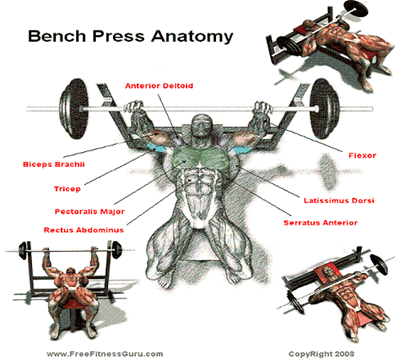 Let’s take a look at the muscles involved in the mighty bench press. Obviously the pecs are the main target and receive most of the work. Never underestimate how much work is done by the anterior deltoids, though. If you find your front delts especially bruised after a big benching session, consider finishing your chest session with a couple of good sets of front raises, and dropping them out of shoulder training day. The triceps also play a huge role, as they are responsible for straightening the arms. Don’t train either delts or triceps right before chest training, or even the day before. Doing so leads to a weak bench presses, meaning either muscle fails before the pecs reach exhaustion. The lats have a huge stabilizing role in the bench press, as do the muscles of the core. Even the legs play a significant role when performing the lift correctly. Now let’s move onto technique. [caption id="attachment_4871" align="alignright" width="400"] Pic: bodybuilding.com[/caption] Slide onto the bench taking a firm grip on the bar, a few inches wider than shoulder width. Too wide a grip can lead to shoulder problems. Always have your thumbs in the position in the picture. Using a false grip with your thumbs under the bar leads to wrist and elbow problems. Bring your feet back slightly. If you have trouble reaching the ground, use a lower bench or pack your feet up with discs or blocks of wood. Never put your feet on the bench! Tighten your legs, allow a slight, natural curve to form in your lower back. There should be just enough room to slide your fingers underneath you. Feel the tension in your shoulders and dig into the ground with your feet. Take a really deep breath, while simultaneously pulling your shoulders back into the bench and pushing your chest up towards the bar. Unrack the weight. Keep your entire body rigid and in position. Breath out then take another deep breath. Steadily lower the weight towards your chest. Don’t let your elbows go straight out to your sides, use a more natural arc, bringing the bar towards your middle or even lower chest. Ensure your wrists and elbows stay in line. Do not bounce the bar off your chest! Too many ribs and sternums have been fractured this way! If you can’t control the weight, it is too heavy! At the bottom of the lift, your forearms should be perpendicular to the floor. Now, feeling all that rigid tension through your entire body, force the weight upwards without letting your chest drop or your shoulders lift from the bench. Feel your chest muscles contracting. Blow out hard; imagine you are blowing the bar skywards. Lock out. Then lower the weight, dragging in a huge breath as you do so. Your rep range for building muscle should be 4-12. Only powerlifters need to regularly hit their one rep max. Always warm up first with a light weight and high reps, then do a set or two at the upper end of this range. Now you are ready to hit the 4-12 rep range. Remember to use a weight allowing you a full range of motion and lift the weight correctly. Regarding the number of sets, remember heavy pressing places a huge strain on the joints and can lead to both long term and overuse injuries. Do only the amount of sets necessary to fatigue the chest. Go for quality over quantity. Great lifters like Dorian Yates could destroy his chest in just two or three TOP QUALITY sets. Develop the mind-muscle connection! [caption id="attachment_4872" align="alignright" width="400"] Pic: 507fitness.com[/caption] Incline and decline bench presses develop a full chest. If you have an underdeveloped upper chest, consider starting your chest workouts with incline bench presses. Adding chains (pictured) adds intensity. The weight is lighter through the harder, lower part of the lift, but as more muscle fibers are involved, the chains lift from the ground, adding resistance at the top. Simple but effective! An extremely effective variation for building raw power is the dead bench press. Set up in the power rack, adding stoppers just above chest level. You will lift each rep off the stoppers, eliminating momentum and testing your pure power and strength. 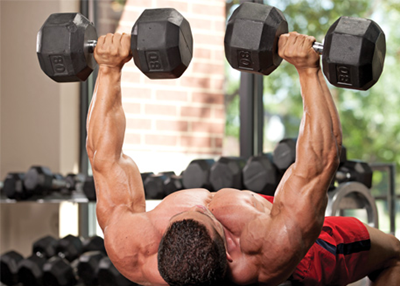 The ultimate bench press variation is the dumbbell bench press. [caption id="attachment_4873" align="alignleft" width="400"] Pic: muscleandperformance.com[/caption] While the barbell bench press has its place in strength and power training, it is now widely believed the dumbbell version is far superior for building muscle. This is primarily because it demands a full, more natural range of motion. Unlike the barbell bench press, you can bring your arms inwards at the top to effectively squeeze the pecs. This builds a good, strong, inner chest. The natural range of motion means a significantly lower risk of injury. Your shoulders are no longer forced through a fixed motion leading often to nasty overuse injuries. Also, you can’t get stuck underneath dumbbells. You can simply toss them away from you (be aware of your surroundings). To perform the dumbbell bench press, begin by sitting on the end of a bench with the weights resting on your thighs. Lay back onto the bench as you push the weights back with your legs, into the start position. Now, using the same body position and technique as with the barbell, do your bench presses, finishing with them touching at the top. When done, don’t try to control the dumbbells all the way to the floor, this is a recipe for injury. Make a little noise as you guide them towards the ground. You don’t need to throw them, but don’t attempt to place them down either. So, How Often Should You Bench Press? Once a week is sufficient for most people. It’s an extremely testing and intense lift, so you need adequate time to fully recover and rebuild. If you’re young, you could get away with training twice per week. Should You Do Bench Presses at the Start of Your Chest Session? For most people, yes. However, if you find that your triceps are a weak link and fail first, you should pre-exhaust the chest with flyes, pullovers, or both. Sheer Strength Labs Sheer NO2 Nitric Oxide Booster gives huge pumps on chest day. This extremely potent supplement increases blood flow to the muscles by dilating the blood vessels, leaving you with a massively inflated chest fit to burst out of your vest.